Shopify merchant interview with Bree Heather from Swoodi. In our first ever Shopify merchant interview, we chat with Bree Heather, owner of Swoodi, makers of swim wear clothing. This is an interview we did for our podcast, with Shopify merchant Bree Heather, from Swoodi. Our Shopify podcasts are great for people who want to learn from merchants, hear ecommerce business stories, find tips and tricks, or just expand their knowledge about the Shopify ecommerce platform. You’ll find all our our merchants interviews published here, and if you’d like to subscribe to our podcast, hit the link below, or search for The Cut in your preferred podcast platform. I did a lot of research and joined a Facebook groups called ‘Mum’s With Hustle’ and it's a lot of other small businesses and I asked a lot of questions and 90% of the people on that recommended Shopify, so that definitely helped me make the decision. Today we're going to talk to Bree Heather who owns a Shopify store where she sells a brand called Swoodi. Good morning, Bree. How are you today? Awesome. This is really cool and exciting and we are very happy to be speaking to you in our first ever Shopify merchant interview for our podcast here at The Cut. So can I ask you to introduce yourself and tell us about your ecommerce business? Sure. So my name is Bree. 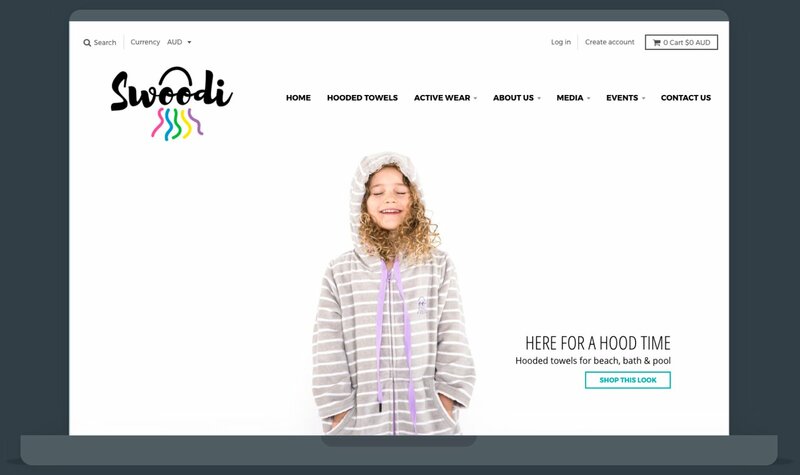 I've got a children's wear label called Swoodi. We specialise in hooded towels for kids and we also have a small active wear range with exclusive prints. Awesome. Swoodi is a really cute name. I love it. Can you tell us a bit more about those products and what are they exactly? Sure. So our main product, which is a hooded towel or a 'swim hoodie’ as we call it, is actually a hoodie crossed with a towel. So it looks like a hoodie, but it's actually a towel. I understand exactly. I have to confess that my wife and daughter do not have Swoodi’s, but they have a similar kind of product. In fact, my wife was just talking about them the other day because apparently one of your competitors have have gone out of business recently. They’ve stopped production recently, but anyway, that's a bit of an aside. How long have you had your business for? So I launched in September last year (2017), but I had been working on the product development for about 18 months previous to that. And can you tell us about the start of the beginning of your business maybe at the conceptual stage when you first had the idea and then the actual launching stage of your website and going into business. So I've got two young kids and they love to swim. We do surf club and we are very active in the water and I was looking for a product but I couldn't find anything that I liked. So I thought that there was a gap in the market. So I decided to develop my own product, which is where I came up with the swim hoodie. Brilliant. I think think your situation is really common in the Shopify community. There are lots of mums and dads with young kids who are starting small businesses themselves based on an idea just like yours where you had a need for something and you've come up with an idea. So obviously my next question was going to be what inspired you to start the business, but that's pretty clear. It was your lifestyle and your own kids, is that right? Yeah, it was, it was definitely my kids, and pre kids I was actually an underground mine surveyor and since having kids I couldn't return to my career, so I wanted something that I could have for myself. I work from home and can still be there for my kids. Absolutely. And again, I think that's a really common motivation, isn't it? To find a business that can be run from your living room at least to start with and then see what happens with it from there. Absolutely. And for me, the kids are a big part of it. They help me pack orders and everything like that. So it's actually turned out really well. (Laughs) So you have your own staff, you’re breeding and making your own team of staff. Is that right? (Laughs) I am teaching them young. Fantastic, lovely. Well working with your young kids in your business as well, that must be awesome. Oh they love it. They really do. I bet they do. But wait until they're teenagers and I bet they're not going to be quite so keen (laughs). So moving on to Shopify specifically, how long have you been using Shopify for? I was using Shopify for a couple of months before I launched, so it'd be coming up 12 months now. I did the free trial and had to play around with it, but I also used it for a couple of months before I launched my store. Okay. So how did you find it and then decide to commit to Shopify? How or why did you choose Shopify? I did a lot of research on it and I also joined a couple of Facebook groups. There's one called ‘Mum’s With Hustle’ where I got on it and it's a lot of the other small businesses and I asked a lot of questions and 90 percent of the people on that recommended Shopify, so that definitely helped me make the decision. Okay, that's awesome. So you didn't sort of have to do a lot of research or compare it, comparisons with other platforms you were happy to commit to Shopify based on the community were you? Yeah, absolutely. And it was also good with Shopify because it was great to start out on that. I also liked that as my business grows that I can still use Shopify. It's very scalable that can accommodate a very small startup right up to something that, I mean we have some clients at The Cut where they're international businesses and doing huge volumes and massive amounts of revenue every year. So yeah, as you say, it's scalable and it can handle anything from the very beginning right up to, I guess your wildest dreams in business. So what was it like, you know, describe for us and our listeners what it was like setting up your Shopify website? How was that process for you? It was actually a little bit easier than I thought. I don't have any tech experience or anything like that which was a bit daunting to me, but once I got into it it was actually extremely user friendly and they also have amazing help as well. So if I did get stuck questions got answered, I got help straight away, which was fantastic. So it was actually quite a nice experience for me. That sounds great. They do have a very supportive community and there's a number of channels and ways you can reach out to support and even some Slack communities and as you've said there's Facebook and social media groups that are just built around people who share Shopify as their platform. Exactly. And then I'm using the Shopify Help with their chat or if it wasn't an urgent question, just using the email help as well. Yep. Yeah, we've got a number of different options, haven't you? Yes. Can you remember your very first sale and what that felt like for you? I sure can. It was actually funny because I didn't realise that the Shopify app made the ‘cha-ching’ noise. Me and the kids are hanging out at home and we heard a ‘cha-ching!’ and we thought what was that? And then we checked my phone and it said that I'd had a sale, so it was, it was wonderful. It was so awesome. We still get excited when we hear that cha-ching sound. Well, I think that that's the perfect sound to make. I don't think I've ever heard it personally, but I have heard people speak about it. It's an absolute classic. And how long after launching the site was that, when did that first sale happen for you? it was a couple of days, so pretty quick I guess. Yeah it was, and for us, it was just trying to get the name out there and let everybody know the product. One of my all time favourite apps is ‘Ready To Ship’, so when I get an order it drags all my data across and it's as simple as printing out a label which then automatically books my courier. The time I've saved using this app when packing orders is just amazing. Yeah, absolutely. The marketing and we'll get onto some of those things in a little while. Obviously we can sit here and make it all sound a completely awesome and easy and smooth sailing. But definitely we're all very much aware that running a small business, whether it's online or offline, is challenging and there will be challenges in it. So can you tell us some of the biggest challenges you've experienced in running your ecommerce business? For me, it's definitely been trying to keep up with all of my platforms. I basically do everything myself. So there are times where I guess I struggle with time and trying to keep on top of my Instagram, my Facebook, my website updates and blogs and that's definitely been a big challenge for me and also understanding SEO. Okay. So it sounds like for you, the biggest challenges are around actually marketing your business rather than managing the products in the store itself. Is that accurate? Yeah, absolutely. And I'm not coming from a marketing background or knowing anything about it. That's definitely been one of my biggest challenges. Yeah, sure. And I guess that is ongoing, relentless activity that's expected of you and you need to have that happening to make the business succeed. It never really ends does it, the marketing side of it? And so how do you approach and manage that if we focus in on it for you as being the ongoing marketing and social media content and that sort of thing. How do you manage those challenges and sort of get to a point where you're doing enough activity that you feel like you're keeping on top of it? I guess with that, my cousin helps me a little bit now with my Instagram and doing all the copy for that, which is a big help and also finding content for me which takes the pressure off. And with things like my SEO marketing we have decided to hire a specialist, which I started working with last month and am trying to prioritise. That's definitely the biggest thing as well, just starting with what's the most important and effective. And then working down the list. Sure. I think it's so important that people understand the need to look at the data and look at the measurement because everything digital is measured and there's data there and you can see what is working best and what's not working quite so well. And do more of the good things and less of the less effective things. I mean invariably people are using apps and plugins with Shopify to deliver different features and functionality. Do you have some favourites you could talk about? Absolutely. One of my all time favourite apps is the app ‘Ready To Ship’, so when I get an order it drags all my data across into to their app and it's as simple as printing out a label which then automatically books my courier so I don't even have to call the courier and the time I've saved using this app when packing orders is just amazing. Ready to ship? Yeah. Okay. Well everyone can take note of that. That sounds awesome. And I was going to ask how does that add value to your business? It clearly is mostly around time saving is it? Yeah, absolutely. And the fact that I don't have to call a courier or anything like that and it's really, really user friendly. That sounds like a really valuable one to use. Do you have like three top insights that you'd share with other people running an ecommerce business or, or you're using Shopify specifically? I think one of my biggest insights would be utilising the apps like Ready To Ship to save time. And how did you go about finding that particular app, for example? For me I really researched the shipping part of it. There are other add ons like Australia Post and things like that. I also saved money on postage. And so that was a big thing for me being a small business, I needed to save as much money as I could. So Ready To Ship offered really great a postage costs compared to other providers. Okay. That's an awesome tip. And do you have any others, do you have any other favourite apps or tips that you could share with the community? Sure. I think one of my other favourite apps is one that you actually recommended to me. Yotpo. Yeah. I was going to say one of our biggest clients have been big fans of that App. Oh, it's just great because it means that my customers can leave me reviews, which is also valuable for me because I get amazing feedback on the product. Yeah. How much of that feedback is positive and how often do you get feedback that might be negative, but might give you ideas for evolving what you're doing in the business or with your products? Well it's funny. On my site I think I've got just over 20 reviews and all of them have been five star. So that's, that's been such an amazing confidence boost for me. And it allows you to say that people are out there are happy with what you're giving them with Swoodi, right? If you could give your young Shopify self some advice today, what would it be? I think one of the biggest tips would be you will never have as much time as pre launch. So use the time wisely. That's really good advice. So specifically for you, if you could go back when you had that time, what would you use the time for? I definitely think it would have been setting up things a little bit bit better. I guess with me, I've learned a lot along the way, but if I could apply all of what I've learned now to pre launch, it definitely would've been a better process. Yeah. One hundred percent. I guess coming back to what you were talking about before, look at what sort of marketing you might've been doing, like planning a strategy or planning content directions or even gathering together photographic assets and that sort of thing. I focus a lot on social media, I have used influencer marketing and recently ran a Facebook ads campaign which was successful. Being a product based business, I feel it's important to be present in the market so I attend expos so people can see and feel the product, and build brand awareness. Okay. So let's, let's talk about some traffic conversion ideas and marketing. What sort of marketing do you invest in and that might be a financial investment or a time investment, which is, as we all know is worth a lot of money as well. What's your focus with your marketing? I do focus a lot on social media. I have used influencer marketing. I've just recently ran a Facebook ads campaign which was quite successful, but for me, being a product based business, I also feel that it's important to be present in the market. So I do attend some expos and I'm going to be attending One Fine Baby in Melbourne and Sydney this year. It’s so people can see the product, feel the product and build a bit of brand awareness. For sure. I mean I guess in one way that's a limitation of online selling is people can't touch and feel, and that's why returns policies and free mail are so important so people can feel like there is that element of getting it in their hands, making sure they like the product and if they don't for whatever reason, they have an opportunity to send it back and you minimise the pain around that process. Absolutely. And it means that the kids are able to try it on then and there and just little things like that that you don't get on your online store. Yeah. One hundred percent. And how do you drive traffic to your website? Obviously you spoke earlier about SEO and that's something you've started recently. Are you seeing results from that? Well, we only started last month, so not as yet, but we're hoping to see the results within three to four months. Yeah, I think that's realistic and I think if your supplier is telling you those sorts of time frames, then that's a good sign. It's a sign that they're being realistic and managing your expectations because it does take time to build traction with SEO. What do you think is the key to retaining visitors to your site and then converting them into buying customers? For me, it's about building relationships and making it personal and not being too ‘salesy’. I guess I like to create a bit of a community around my brand, you know, we offer a lot of free information and things like that. And I think that for me personally, that brings a lot of people back. So authenticity and a community supported by actual content that is there to help people. Yeah, exactly. We try to focus a lot of email marketing on that as well, not kind of like ‘shop now’. But more about buy the best, you know, or here's a free article of tips and things like that as well, which a lot of people have said they really value. Yeah, for sure. That's a really good strategy and it's a common one. I think it's one that probably a lot of people certainly do do it, but then a lot of people also fall back into that pattern of just trying to sell at every engagement. And as you say, it doesn't build that authentic trusted relationship, does it? No, it doesn't. And I know myself as a consumer, if people come on too hard and fast, I'll definitely take a step back. Absolutely. And I think, I think most people are probably in the same boat. At the end of the day we want to feel like we can take our time, that the supplier is a nice person and genuine and easy to engage with and that they have a nice product. That when we get there, we'll buy it when we're ready. Are you on top of using tools to measure the performance of your website and where your traffic's coming from and even those sort of top level metrics such as time spent on page or bounce rate, session times, those sorts of things. That is something that I'm still educating myself on. I am getting a little bit better at it. You know, I'm definitely pulling up my analytics a lot more and I do find the Shopify analytics quite user friendly and easy to read. And do you exclusively use the Shopify metrics or do you use Google analytics as well? Or a combination of the two? A combination. But for some reason I just feel more comfortable using the Shopify metrics. Sure. Well, I guess it's nice if it's within the platform and you're using the platform every day. So that makes a lot of sense. There's more work involved to juggle two platforms, isn't there? Yeah, absolutely. And I mean I log onto my Shopify store every day and it's there straightaway, so it's just one less thing that I have to worry about. One hundred percent. And let's face it, Shopify are pretty renowned for making things easy for you guys, the merchants as well as your customers at the other end. So before we wrap up and I'll just say really quickly, thank you so much for sharing all your story and your experiences with Shopify. Talking about the future, do you have three things that would be on your Shopify wish list? Either that maybe don't exist now or just things that you want to implement into your business in the future? For my wish list, it's just things like Amazon and ebay integration. I'm not sure if they do that now, but last time I tried because I was an Australian store, wouldn't let me. Okay. And have you tried that since Amazon have launched in Australia? But one of my other wish list items - stackable discounts. One thing that I struggled with that I offer 10 percent off your first order and if I have a local pickup trying to offer the 10 percent and then give them free shipping it just won't let me do it. So that's at the top of my list. That's an interesting one and a good one to note. And Bree, before we get to the very end of our interview, tell me what does the future look like for your business and for Swoodi in general? It's exciting. I've actually started working with some business coaches in Melbourne that specialise in the fashion industry. So we've got some great ideas with them. We're also looking at getting into wholesale and we're also going to be branching out into adult sizes. That sounds really exciting, congratulations. So you've got plenty of work to do over the coming months and year or two. And do you have any final thoughts for Shopify merchants or people considering Shopify or an ecommerce business and starting their first online store? What would be some final thoughts you would give to people who might be listening from that? From that perspective? I'd definitely be having a good play around on the free trial with Shopify or try out different templates. Like I said, join Facebook groups, you can ask questions and people will have had similar experiences. There's also lots of free information out there now to help setting up a small business. Utilise the free information. That's really good advice and certainly the Facebook groups and the Shopify community in general is a really powerful asset for everyone. Well that's the end of our merchant interview. Bree, thanks so much for joining us and being our first subject in this experiment, and we'll look forward to having you up online soon and to perhaps seeing you at our next Shopify meet up here in Perth. But thank you so much again for joining us. You have been awesome. Awesome. Thank you so much for having me. If you’d like to be involved in The Cut’s Shopify podcast, contact us anytime, and if you need help growing your ecommerce business, or learning more about Shopify, we are here to help.